Daila Kronberga’s farm "Dārzi" in the village of Mūsa in Bauska Region was founded in 1992. The farm is run by gardener Daila Kronberga who has more than 40 years of experience growing fruit. The first sea buckthorn seedlings were planted at the farm in April 2004. Subsequently, the farm received its biological farm certificate in 2009. Currently, we grow biologically certified sea buckthorn across an area of 20 ha. The farm is a family run enterprise. Sea buckthorn is planted and harvested by hand. All sea buckthorn product recipes are created by the family itself. Sea buckthorn, other berries and fruit are processed at the SIA “Sangas” production plant using modern technological equipment. 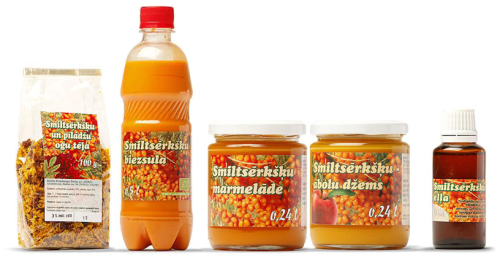 "DĀRZI" farm offers a wide range of products - biologically grown sea buckthorn pulp; frozen sea buckthorn and other berries; assorted berry juices; jams; syrups; sea buckthorn oil; sea buckthorn berry and leaf tea; a delicious sea buckthorn honey pot; rowan jelly; sea buckthorn jellied candies.